The Ohio Republican Party is requesting that the Consumer Financial Protection Bureau hand over all correspondence and documentation regarding its deal with a hedge fund that was handed administrative control of valuable student loan trusts by the agency. The CFPB, a government agency formed in 2010 led by Ohio Democrat Richard Cordray, announced a proposed settlement reached last month with National Collegiate Student Loan Trusts, one of the largest holders of private student debt in the country. Among the consequences of the proposal, which still needs approval from a judge, is that Donald Uderitz, a hedge-fund owner who purchased equity in student loan debt in 2009, was put in charge of servicing hundreds of thousands of loans owned by National Collegiate. Uderitz, who seems to have sparked the intervention with a 2015 audit, supports the proposed settlement reached with CFPB. The settlement makes him the servicer for the loans, in charge of collecting payments on loans that haven't defaulted and conducting an audit of loans claimed to be owned by National Collegiate. Others with more economic interest in the loans than Uderitz are working to stop the agreement, calling into question how Uderitz, who has no experience servicing loans, was granted this responsibility by the CFPB. Ohio Republicans, anticipating a 2018 gubernatorial run by CFPB's Cordray, filed a Freedom of Information Act request on Wednesday that aims to get to the bottom of how Uderitz was chosen to make collections on the loans. 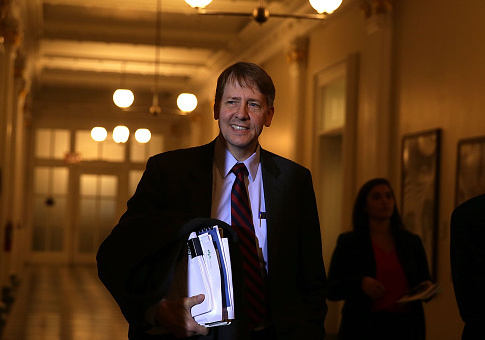 "It's very concerning that Richard Cordray would cut a secret deal that subjects student loan holders to new collection practices that directly benefits a hedge fund manager," said Ohio Republicans executive director Rob Secaur. 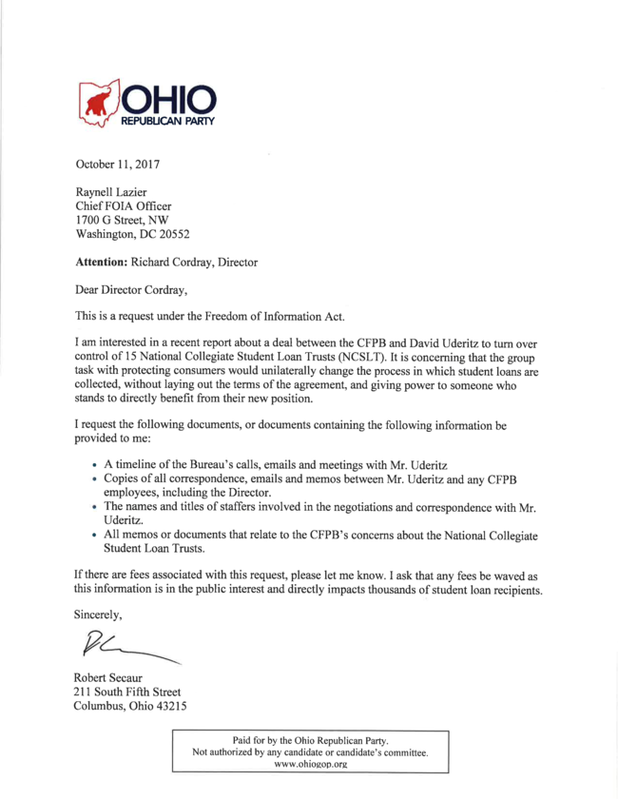 The FOIA request asks for a timeline of all CFPB's communication with Uderitz, copies of all correspondence and documents regarding National Collegiate, and a list of all staffers that worked on the case. CFPB's senior spokesperson Samuel Gilford declined to comment on the FOIA request. Uderitz had been working for years to gain administrative control of the loans, according to Bloomberg. He formed a student loan company that hoped to collect from borrowers who had defaulted on their loans by reducing their balances. Uderitz has suffered losses from the purchase because of the large number of defaulted loans. He said he hopes his losses could be recovered following CFPB's intervention. Critics have argued that Uderitz comes out as the winner of the settlement because he will have the power to administer thousands of fees, which could turn out to be lucrative. Others have questioned why the CFPB stepped in at all to interrupt ongoing lawsuits regarding delinquent student loans rather than allowing them to progress through the legal process. Republicans believe that Cordray intervened in the case for the political boost that going after banks on student loans gives him. "This is just another example of Crooked Cordray abusing his power to boost his political future," Secaur said. This entry was posted in Politics and tagged Consumer Financial Protection Bureau, Loan, Ohio, Richard Cordray. Bookmark the permalink.